Are These Box Art Designs Similar? Folks are fluttering around on the Japanese internet about the boxart similarity between these two games. Kwinky-dink or sinister thievery? 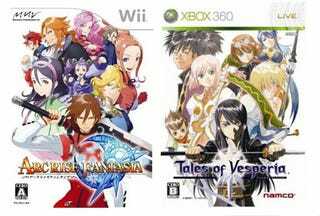 Namco Bandai's Xbox 360 role-playing-game Tales of Vesperia was a big hit when it was released in Japan last summer, selling 161,070 copies. The game was so popular it caused the Xbox 360 to sell out in Japan. Arc Rise Fantasia is an upcoming Wii title from beleaguered Marvelous Entertainment. Sure, there are some similarities, but it's not like Tales of Vesperia invented this style of boxart. Opinions?